Logan Lucky is a 2017 American heist comedy film directed by Steven Soderbergh, based on a screenplay by unknown newcomer Rebecca Blunt. Soderbergh came out of retirement to direct the film, and to distribute it independently through his own company Fingerprint Releasing. The film features an ensemble cast consisting of Channing Tatum, Adam Driver, Riley Keough, Daniel Craig, Seth MacFarlane, Katie Holmes, Hilary Swank, Katherine Waterston and Sebastian Stan, and follows the Logan family, who plan to rob the Charlotte Motor Speedway and must avoid getting caught by the FBI. Logan Lucky premiered in Knoxville on August 9, 2017, and was theatrically released in the United States on August 18, 2017, by Bleecker Street. The film received positive reviews, with many critics praising the cast's performances and Soderbergh's direction, and grossed $48 million worldwide. Jimmy Logan is laid off from his construction job at the Charlotte Motor Speedway. While visiting his ex-wife Bobbie Jo to pick up their daughter Sadie for a beauty pageant rehearsal, he learns that Bobbie Jo and her new husband are moving to Lynchburg, making it even harder for Jimmy to visit. Jimmy goes to a bar run by his brother Clyde, an Iraq War veteran who lost his hand during the war. Max Chilblain, a pretentious British businessman and NASCAR-team owner, arrives and insults Clyde, leading to a fight with Jimmy, which Clyde disrupts by setting fire to Max’s car. The next day, Jimmy reveals to Clyde his plan to rob the Speedway, exploiting his knowledge of their pneumatic tube system for moving money. Clyde and Jimmy recruit their sister Mellie, incarcerated safe-cracker Joe Bang, and Joe's dimwitted brothers Sam and Fish. They plan to break Joe out of prison and return him once the heist is complete. Clyde intentionally gets himself sent to prison on a minor charge. Mellie, Sam, and Fish infest the Speedway's tube system with painted cockroaches, determining which set of tubes to follow. While gathering supplies, Jimmy meets former schoolmate Sylvia, who runs a mobile clinic in need of donations; Sylvia provides Jimmy with a tetanus shot, and the two strike up a conversation. Later, Jimmy learns that construction at the speedway is being completed ahead of schedule, forcing them to mount the heist a week earlier, during the much busier Coca-Cola 600 race on Memorial Day weekend. Joe and Clyde arrange for fellow inmates to stage a riot, resulting in a lockdown to hide their absence. They escape hidden under a delivery truck. Mellie meets them in a Ford Shelby GT350 stolen from Bobbie Jo's husband. At the speedway, Sam and Fish blow up a generator and kill all credit card machines, forcing vendors to accept cash only. Joe improvises an explosive with bleach, gummy bears, and a dietary salt substitute, which detonates within the pneumatic tube system, allowing the crew to begin filling garbage bags with all the vendors' cash. Speedway staff notice smoke, from the tubes, and security guards investigate but are diverted by Jimmy and Earl, one of Clyde's bar patrons. The airflow in the tube delivering the money is suddenly reversed, taking Clyde's prosthetic arm with it. On their way back to the prison, Clyde and Joe are recognized by Chilblain and his sponsored NASCAR driver Dayton White. The heist is a success, and Jimmy makes it to his daughter's pageant in time to hear her perform his favorite song, Take Me Home, Country Roads." Jimmy then abandons the money and anonymously informs the police. FBI agent Sarah Grayson investigates the heist, dubbed “Ocean’s Seven-Eleven” in the press. Due to the unwillingness of prison authorities to disclose the extent of the riot, the refuting of Chilblain's eyewitness account by White (disgruntled after crashing in the race from drinking some of Chilblain's sponsorship energy drink), and the speedway administration's satisfaction with the money's recovery and their insurance settlement, the case is closed after six months. Joe is released from prison and returns home to find a bag of money in his yard. Sylvia receives an anonymous envelope of money in the mail, as does one of the newly released inmates who helped instigate the riot. It is revealed that during the heist, Jimmy separated several bags of money from the rest, sending them to the local dump and collecting them later, along with Clyde's prosthetic hand; he left the rest for the police to find to discourage further investigation. Now working in a hardware store and having bought a house near his daughter and ex-wife's home, Jimmy happily reunites with his family at Clyde's bar. Sylvia arrives and shares a kiss with Jimmy as the rest of the gang share drinks, watched by Grayson. Channing Tatum as Jimmy Logan, a blue-collar laborer whose once-promising football career was ruined by an injury. After being let go from a construction crew at Charlotte Motor Speedway, he devises the plan to rob the Speedway. He is Clyde and Mellie's brother and Sadie's father. Adam Driver as Clyde Logan, Jimmy's brother and a bar owner. He served two tours in Iraq and has lost the lower part of his left arm, causing him to wear a prosthetic arm. Daniel Craig as Joe Bang, a convict known for his safe-cracking experience. He has ties to the Logan family. Jimmy and Clyde enlist him in the robbery to cause an explosion. Riley Keough as Mellie Logan, Jimmy and Clyde's sister, who works at a hair salon. She assists Jimmy and Clyde with the robbery, and Sadie in preparing for her pageant. Katie Holmes as Bobbie Jo Chapman, Jimmy's ex-wife and Sadie's mother. Farrah Mackenzie as Sadie Logan, the daughter of Jimmy and Bobbie Jo. She is competing in a beauty pageant. Katherine Waterston as Sylvia Harrison, a former classmate of Jimmy who runs a mobile clinic. Dwight Yoakam as Warden Burns, the warden of Monroe County Penitentiary, where Joe and Clyde are imprisoned. Seth MacFarlane as Max Chilblain, a pretentious British businessman who has created a drink called "To the Max". He owns a NASCAR team, whose driver is Dayton White. He gets into a fight with Jimmy after making fun of Clyde's prosthetic arm. Sebastian Stan as Dayton White, a NASCAR driver who prides himself on healthy eating and exercise. Brian Gleeson as Sam Bang, a dimwitted brother of Joe. Jack Quaid as Fish Bang, a dimwitted brother of Joe. Hilary Swank as Sarah Grayson, an FBI agent assigned to investigate the robbery. David Denman as Moody Chapman, Bobbie Jo's husband and the owner of multiple car dealerships. Jim O'Heir as Cal, the head of the construction crew at the Speedway. Macon Blair as Brad Noonan, Sarah's partner in the investigation. Six other NASCAR drivers make cameo appearances in the film. Carl Edwards and Kyle Busch are West Virginia state troopers, Brad Keselowski and Joey Logano are security guards, Kyle Larson is a limousine driver, and Ryan Blaney is a delivery boy. LeAnn Rimes, Adam Alexander and Jesco White also make cameo appearances. Soderbergh's Behind the Candelabra (2013) was intended to be his final film as director. 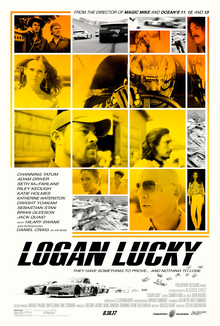 Soderbergh has said that he was initially given the Logan Lucky script in hopes that he could recommend a suitable director for the project, but he enjoyed reading it and decided to take it on for himself, specifically noting that it was an "anti-glam version of an Ocean's movie". He told Entertainment Weekly, "Nobody dresses nice. Nobody has nice stuff. They have no money. They have no technology. It's all rubber band technology." At the time, Soderbergh was also theorizing a new distribution model and felt that the script gave him the perfect opportunity to do so. The film was announced in February 2016, along with Channing Tatum's casting. Variety initially reported that Matt Damon was also to star, although Deadline Hollywood reported the same day that Damon was not involved, but rather Michael Shannon. Shannon later left the project due to scheduling conflicts. Much of the rest of the cast was announced between that May and August, among them Seth MacFarlane, Adam Driver and Daniel Craig in May, Hilary Swank in June, and Jim O'Heir in August. There has been media speculation regarding the identity of the film's screenwriter, Rebecca Blunt. The film's production notes state that she is a native of Logan, West Virginia who now lives in New York City, and that she is a first-time screenwriter. No one other than Soderbergh and Adam Driver has personally vouched for her existence. Some people involved with the film have exchanged emails with a person they believed to be her, and think that she lives in the United Kingdom. Sources speculated that "Rebecca Blunt" was actually a pseudonym for Soderbergh's wife Jules Asner, for comedian John Henson, or for Soderbergh himself. According to The Playlist, Asner was the sole screenwriter and chose to use a pseudonym because she did not want the perception of the film to be that "Soderbergh was directing his wife's script." Logan Lucky began filming on August 24, 2016. Production lasted 36 days, with much of the photography taking place at the Charlotte Motor Speedway and Atlanta Motor Speedway during the NASCAR race meetings at both circuits. The Atlanta outside barriers were repainted yellow, in an attempt to resemble Charlotte; the Charlotte track has yellow walls, owing to then title sponsor Sprint; Atlanta has white walls with red and blue pattern for the charity that is involved with race sponsor QuikTrip. The scenes with the Fox commentators inside the commentary box were shot in Atlanta, because in Charlotte the commentators are typically positioned on top of the grandstand roof for opening broadcast scenes. David Holmes composed the score for Logan Lucky, having previously scored other Soderbergh films, including Out of Sight, the Ocean's Trilogy, and Haywire. The soundtrack was released by Milan Records; it includes the cue "Original Score Medley" by David Holmes, and music by various artists. The film features "Flashing Lights" by Screamin' Lord Sutch and Heavy Friends. Fingerprint Releasing and Bleecker Street released the film on August 18, 2017. Logan Lucky is the first film distributed by Fingerprint Releasing, which Soderbergh created to distribute films independently, instead of through big studios. The distributors spent $20 million on prints and advertising. Logan Lucky grossed $27.8 million in the United States and Canada, and $19.8 million in other territories, for a worldwide total of $47.5 million, against a production budget of $29 million. In North America, the film was released alongside The Hitman's Bodyguard, and was projected to gross $7–9 million from 3,008 theaters in its opening weekend. Having already covered the cost of the production budget through international advance sales, and the costs of prints and advertising through a deal with Amazon, Soderbergh said a debut of $15 million would be needed to be considered a success. The film grossed $2.8 million on its first day (including $525,000 from Thursday night previews). It went on to open to $7.6 million, finishing third at the box office, behind The Hitman's Bodyguard and Annabelle: Creation. In its second weekend, the film took in $4.2 million, dropping 44.2% and finishing 5th, in what was the lowest combined grossing weekend (for the top 10 films) since September 2001. During the following weekend, which preceded Labor Day, the film made $4.4 million over three days (an increase of 4%), and an estimated $5.5 million over the four-day weekend. It was again part of a historically low weekend, as it was the worst combined holiday weekend since 1998. On review aggregation website Rotten Tomatoes, the film holds an approval rating of 92% based on reviews from 256 critics, with an average rating of 7.4/10. The website's critical consensus reads, "High-octane fun that's smartly assembled without putting on airs, Logan Lucky marks a welcome end to Steven Soderbergh's retirement — and proves he hasn't lost his ability to entertain." On Metacritic, which assigns a weighted average rating to reviews, the film has a score of 78 out of 100, based on reviews from 51 critics, indicating "generally favorable reviews". Audiences polled by CinemaScore gave the film an average grade of "B" on an A+ to F scale, while PostTrak reported filmgoers gave it an 80% overall positive score. Owen Gleiberman of Variety gave the film a positive review, writing, "Steven Soderbergh's Logan Lucky is a high-spirited, low-down blast." Todd McCarthy of The Hollywood Reporter gave the film a positive review, saying, "This is a good-times film that doesn't put on airs, dress to impress or pretend to be something it isn't. It just aims to please and does a pretty good job of it." Matt Zoller Seitz of RogerEbert.com gave the film three-and-a-half out of four stars, praising the smooth direction and efficiency of storytelling Soderbergh brought to the film, and stating that other than needing additional scenes to give its "oddball characters" more depth, "[Logan Lucky is] a precision-tooled entertainment made by experts, and sometimes more than that. Watching it is like finding money in the pocket of a coat that you haven't worn in years." Rex Reed of The New York Observer was critical of the film, and described Soderbergh as an overrated director. Reed complained that the film takes a slower pace than Ocean's Eleven, and although he praised the camera work, music and ham acting, he concluded, "It doesn't work. Logan Lucky is as charming and welcome as toenail fungus." Logan Lucky was released on digital download on November 14, 2017, and on DVD, Blu-ray, and Ultra HD Blu-ray on November 28, 2017. ^ a b Pseudonym for Steven Soderbergh. ^ a b Perez, Rodrigo (July 27, 2017). "Logan Lucky Screenwriter Revealed". The Playlist. Retrieved July 27, 2017. ^ "Logan Lucky (12A)". British Board of Film Classification. Retrieved 5 September 2017. ^ a b c "Logan Lucky (2017)". Box Office Mojo. IMDB. Retrieved July 13, 2018. ^ Giles, Jeff (August 17, 2017). "The Hitman's Bodyguard Misses the Mark". Rotten Tomatoes. Fandango Media. Retrieved August 17, 2017. ^ Gluck, Jeff (October 9, 2016). "NASCAR serves as vehicle for heist film 'Logan Lucky' starring Channing Tatum". USA Today. Retrieved July 24, 2017. ^ Sullivan, Kevin P. (April 21, 2017). "Steven Soderbergh compares comeback film to Ocean's movie 'on cement blocks'". Entertainment Weekly. Time. Retrieved June 28, 2017. ^ a b Fleming, Mike Jr. (February 4, 2016). "Michael Shannon To Team With Channing Tatum And Steven Soderbergh". Deadline Hollywood. Penske Business Media. Retrieved August 24, 2016. ^ Busch, Anita (May 11, 2016). "Adam Driver Steps Into Steven Soderbergh's 'Logan Lucky'; Seth MacFarlane In Talks". Deadline Hollywood. Penske Business Media. Retrieved August 24, 2016. ^ Busch, Anita (May 26, 2016). "Daniel Craig And Katherine Heigl Finalizing Deals To Join Steven Soderbergh's 'Logan Lucky' As James Bond News Surfaces". Deadline Hollywood. Penske Business Media. Retrieved August 24, 2016. ^ Busch, Anita (June 9, 2016). "Hilary Swank Latest To Board Steven Soderbergh Heist Film 'Logan Lucky'". Deadline Hollywood. Penske Business Media. Retrieved August 24, 2016. ^ Cook, Justin (August 22, 2016). "Parks and Recreation actor Jim O'Heir joins Steven Soderbergh's Logan Lucky". Flickering Myth. Retrieved August 24, 2016. ^ Hooton, Christopher [@ChristophHooton] (August 21, 2017). "Great blurb for the elusive "Rebecca Blunt" in the Logan Lucky production notes" (Tweet). Retrieved May 10, 2018 – via Twitter. ^ Reuters Staff (August 21, 2017). "'Logan Lucky' writer mystery: Is she real? Yes, says Adam Driver". Reuters. Thomson Reuters. Retrieved 17 September 2017. ^ Siegel, Tatiana (July 27, 2017). "Steven Soderbergh's New Movie Writer Likely Doesn't Exist". The Hollywood Reporter. Prometheus Global Media. Retrieved July 28, 2017. ^ Janes, Théoden (May 13, 2017). "Channing Tatum shot a movie at Charlotte Motor Speedway. Here's everything we know about it". Charlotte Observer. Retrieved September 23, 2017. ^ filmmusicreporter (July 20, 2017). "'Logan Lucky' Soundtrack Details". Film Music Reporter. Retrieved January 5, 2018. ^ Hipes, Patrick (February 16, 2017). "Bleecker Street Inks U.S. Deal For Steven Soderbergh's 'Logan Lucky', Sets August Release". Deadline Hollywood. Penske Business Media. Retrieved February 16, 2017. ^ Faughnder, Ryan (August 17, 2017). "Will Steven Soderbergh's strategy of bypassing the studio system for 'Logan Lucky' pay off?". Los Angeles Times. Retrieved August 19, 2017. ^ a b D'Alessandro, Anthony (August 20, 2017). "'Hitman's Bodyguard' Flexes Muscle With $21M+ Opening During Sleepy Summer Weekend". Deadline Hollywood. Penske Business Media. Retrieved August 20, 2017. ^ a b Brueggemann, Tom (August 21, 2017). "Steven Soderbergh, What Happened? 4 Reasons 'Logan Lucky,' Wasn't". IndieWire. Penske Business Media. Retrieved September 5, 2017. ^ Fuster, Jeremy (August 15, 2017). "'Hitman's Bodyguard' and 'Logan Lucky' Unlikely to Boost Box Office This Weekend". TheWrap. Retrieved August 16, 2017. ^ a b D'Alessandro, Anthony (August 19, 2017). "Looking Under 'Logan Lucky's Hood As 'Hitman's Bodyguard' Stands Tall With $21M Opening". Deadline Hollywood. Penske Business Media. Retrieved August 19, 2017. ^ D'Alessandro, Anthony (August 27, 2017). "Don't Blame Hurricane Harvey & Showtime Fight For Weekend's Lousy Box Office: Distribs Served Up Lackluster Titles". Deadline Hollywood. Penske Business Media. ^ D'Alessandro, Anthony (September 3, 2017). "Labor Day Weekend The Worst Since 1998 As 'Hitman's Bodyguard' Holds No. 1 For 3rd Weekend With $12.9M". Deadline Hollywood. Penske Business Media. ^ "Logan Lucky (2017)". Rotten Tomatoes. Fandango Media. Retrieved May 9, 2018. ^ "Logan Lucky Reviews". Metacritic. CBS Interactive. Retrieved August 30, 2017. ^ Gleiberman, Owen (July 24, 2017). "Film Review: Steven Soderbergh's 'Logan Lucky'". Variety. Penske Business Media. Retrieved July 25, 2017. ^ McCarthy, Todd (July 24, 2017). "'Logan Lucky' Review". The Hollywood Reporter. Prometheus Global Media. Retrieved July 25, 2017. ^ Seitz, Matt Zoller (August 17, 2017). "Logan Lucky Movie Review & Film Summary". RogerEbert.com. Ebert Digital LLC. Retrieved August 17, 2017. ^ Reed, Rex (August 18, 2017). "Misguided Cast Delivers Brain-Dead Script in Soderbergh's 'Logan Lucky'". The New York Observer. Retrieved September 8, 2017. ^ "Logan Lucky (2017)". DVDs Release Dates. Retrieved October 3, 2017. This page was last edited on 19 April 2019, at 15:22 (UTC).